Your kids have been back to school for a few weeks, and you’ve been enjoying some time to yourself again. You prepped your kids for school with new clothes and their long list of school supplies, but did you remember to pick up a few pairs of earplugs? As a parent, you’re always thinking about your child’s safety, and you teach them how to look both ways before crossing the street and avoid talking to strangers. But have you talked to them about their hearing? When you think about dangers at school, you probably think about bad grades, or the classroom bully, but noise might not cross your mind. However, schools are incredibly loud places, with bustling hallways, noisy cafeterias, and extremely loud activities like band practice or gym class. Has your child had trouble hearing you the last few weeks, seemed distant, or come home complaining about a ringing or buzzing sound in their ears? They might just be distracted, but this could also be an early sign of hearing loss. Wait a minute. I thought hearing loss only affected seniors! While it’s true that seniors often face hearing loss, it’s a myth that only the elderly struggle to hear. People of all ages can experience noise induced hearing loss (NIHL) from exposure to dangerously loud sounds. Think about the construction site you pass every day on your commute, the barking dogs in the neighborhood, the squealing bus breaks, and the pumping music at the gym. Any and all these sounds could be damaging your hearing. Loud noises affect the delicate cells in the inner ear, and once these cells are damaged or destroyed, hearing loss is permanent. NIHL can be sudden, from one extremely loud noise right beside you. More often than not, it’s a gradual process from the strain of too many loud noises, and it’s hard to recognize at first. 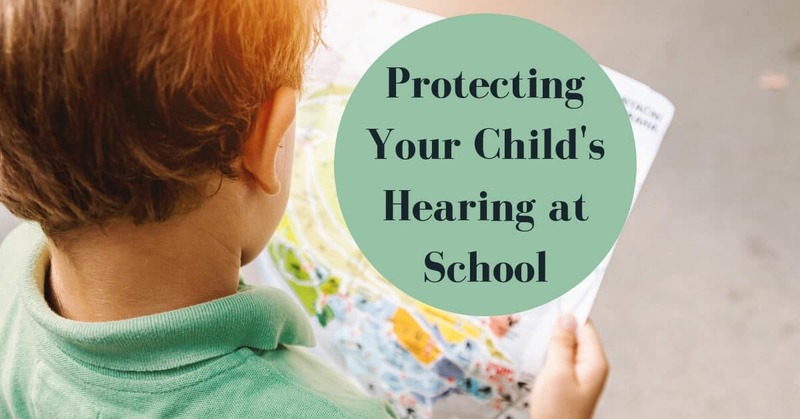 Children are especially vulnerable to NIHL as their ears are still developing, and they spend all day surrounded by dangerous noise levels at school. The first step to protecting your child’s hearing at school is to talk to them about their hearing. Explain how the ear works, and how noise can be damaging to their ears. Once they understand the risks to their hearing, they’re much more likely to be engaged in the process of protecting their hearing. Help them understand which sounds are too loud, like band practice or noise on the bus ride home from school. A good rule of thumb is that if your child has to yell to be heard by their friends standing next to them, it’s too loud and they should be protecting their hearing. If your child has a smartphone, you can even download a decibel reader app, and they can see for themselves when loud becomes too loud. An essential item in your child’s school bag is earplugs. Foam earplugs are a good choice, since they’re easy to insert, and cheap to replace if they get lost. Teach your child how to wear them properly and encourage them to put in earplugs whenever it gets too loud, whether at the lockers, in the playground, or in the gym. If you’re worried about noise levels at your child’s school, take the time to talk to your child’s teachers about your concerns. They can encourage your child to wear earplugs when it gets too loud, and monitor noise levels more closely. Maybe they can teach the class about hearing, and work together as a team to keep everyone’s ears safe. If you’ve noticed that your child isn’t hearing as well as they should be, or you’re concerned about their hearing health, call us today at My Hearing Centers to schedule a hearing test. It’s critical that you catch your child’s hearing loss as soon as possible, and seek treatment immediately. Hearing is vital for their ability to learn and grow, hear the teacher, and participate in classroom activities. Our hearing devices designed especially for kids will have your child excited to put them on every morning, and you’ll rest easy knowing that their unique programs are helping your child hear the teacher clearly, focus on tasks, and connect with their peers.